If you're new to these arts, this is the place to ask "stupid" questions and get directions! I am unsure as to whether this is the correct venue for me to address this, but I will give it a shot nonetheless. I have been engaged in an effort to preserve a language, known as Kidden, which exists in my community. Insofar as I can tell, only my family and a few others in my community speak it or have ever heard of it. I have found no existing information about it from any searches which I have performed. While I recognize that it is not a "conlang" as you call it, I feel that several techniques which your community has might be able to help me. My question revolves around the fact that Kidden is a language which, much like Mandarin and other Oriental languages, works on a basis of logographic and phonetic characters which can be spoken each as one syllable. I have, for my language, created a drawn character set of many characters, and would like to implement a pinyin-style input panel for it on Windows. My question is, therefore, how might I accomplish this, if anyone on this forum might know? Having read several threads on this board, I have found that the general consensus is to simply keep the language in phonetic form. However, I am very hesitant to do this because one of the most unique features of our community's language is its very intuitive and fluid writing style which is very easy on the hand and eyes. I would very much like to preserve this quality, and also use it to help other members of my community keep the written form alive while that is still a viable possibility. My estimate for the number of distinct characters in the language is approximately two to three thousand, albeit many of them are quite rare, and therefore most of them are forgotten in my community (the majority of written texts in my language are very old handwritten documents, usually things like marriage records, birth announcements, and messages on postcards). I have not found any examples of typed samples, whether by computer or by printing press. Because of this, my library of characters would likely continually expand, and this would pose a real challenge to anybody in my community who might use it because they would continually need to update as my work continues. What do you guys think? Is there a way for me to implement this, or is another route more accessible? May I ask for more information on this language? Where is this language spoken? Can we see some pictures of the script? What language family is it a part of? Here's some resources for your question: https://www.reddit.com/r/conlangs/comme ... _alphabet/. You could override the native CJK font area with a new font and have your family download that font. Fairly difficult tmk, but I believe that's what clawgrip did for Caber. Could you perhaps upload transcriptions and pictures of said language. I feel that in order to preserve the language, it's paramount to have a phonetic representation at minimum for the language. I would highly recommend putting up samples of the language. What is made of man will crumble away. I'm curious about this language. Do you know if it's related to any other languages? Is "Kidden" the native name of the language? What part of the world do you live in (i.e. what part of the world is this language spoken in)? GrandPiano wrote: I'm curious about this language. Do you know if it's related to any other languages? Is "Kidden" the native name of the language? What part of the world do you live in (i.e. what part of the world is this language spoken in)? I'm also curious about this language. I did a websearch on it, but I found nothing but this thread. Last edited by Xing on 14 Apr 2016 13:46, edited 1 time in total. This forum is for artificial languages we've made up for fun, if your language is a locally spoken natural language, then linguists would be very interested in documenting and preserving it. I am terribly sorry for abandoning this post (it is unlike me to do so). So, to reply first to the idea to hijack the CJKV character set, yes, I could do that. I looked at your reference link, and it does seem to fit the mould. That said, (and ironically), I happen to know Chinese and would need the CJKV character set, although I might be able to just hijack a specific part, say the set of Korean characters, to do so. That might also work. Next, as many of you seemed curious, I will give a bit of background. I did not intend to do so, as this is not a conlang, but if you wish I shall elaborate. I have no clue where this language comes from. All that I do know is that the only speakers I can find are about 20 people (or like 150-200 if you count kids who know a little bit) who are mostly within my family and some neighbours. We live in New Jersey, and from what I can find (thanks, ancestry.com), we came from Albania, but everybody in my family said that we are from either Syria or Persia (now Iran). Moreover, there is very little to no similarity between Kidden and any European or mid-eastern language. 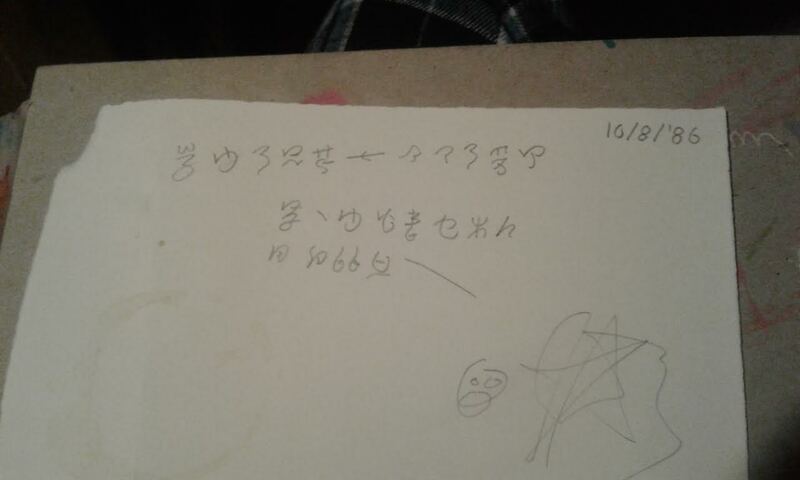 The written form looks nothing like Arabic or Farsi, and more like some really deformed Chinese or Yi, but the characters do not match up between them. [I have tried to attach an image of a sample text so that you can see, but I cannot figure out how]. As for researching it, I have looked for, I don't know, hundreds or thousands of hours at other writing systems trying to find anything similar. The closest-looking that I found were the grass-script Chinese, Demotic, and Japanese, but no characters seem to have any meaningful relation. There was also the Mongolian and Manchu scripts, but the similarity is only very, very marginal. Kidden is logographic and monosyllabic, whereas Mongolian and Manchu are not, and they are written with connected characters from top to bottom, whereas Kidden is like English. Note too that, even for a small language of only a few speakers, there seem to be several different handwriting styles, which complicates the matter of preserving, translating, and transcribing. As for spoken, it sounds somewhat like a mix between some Dravidian languages and maybe Arabic, but, again, the similarities are marginal. Also of interest is that two of my cousins speak it with clicks which I know are common to some Bantu languages, but nobody else does that, and I have no way of telling if they are just mispronouncing or if the language did have them (although I doubt it). Now, I must also note that I am not a linguist. I have not come up with a chart of Kidden's phonemes or other such things; I just made a character-to-pronunciation and meaning chart. The writing system itself is unique, unlike anything I could find in research. Like Chinese, there are certain strokes which make up the characters. However, the strokes have phonetic meaning. The characters have visual meaning, insofar as you can often guess the meaning by the way the character looks, but you can also get clues to what it sounds like by what strokes the character is made of. This isn't like Chinese where a character can have a phonetic or etymological component or radical, it is, rather, that the strokes themselves often are sort-of like letters (but not strictly). Even so, there is no real stroke order to writing like Oriental languages have. There are certain ways that certain characters are written, but often the phonetic component to the strokes have no bearing on the handwriting. Now, as I said, the only historical documents which I have are about a few hundred hand-written letters, cards, birth announcements, and marriage records, containing many characters my family cannot understand (but which, with a little contextual work, I was able to discern their approximate meanings). As for the name of the language, I have no idea where it comes from. "Kidden" is not a word in the language itself, and actually does not sound like most other words. I figure the name is probably from some other language, like maybe our ancestors got the name while they were in Syria or something. So... that is all that I know. I shall try to create a new Korean-language font with all Kidden characters, and will be active listening for responses. Again, apologies for abandoning the thread for a few months. I know that that is bad manners. Sorry. qwed117: I have a dictionary of about 2,600 words (I just did a rough estimate of my word list), and a list of about 500 unknown or roughly-defined characters. I like your idea of using the Swadesh list to see if it is related to any other languages or otherwise to classify it. My follow-up questions would be: first, would it be useful to just transliterate it, or would showing the symbol also be good? Furthermore, there are some big differences in pronunciation of some words, where different parts of my family speak with apparently different accents (which is weird for such a small community of speakers). How should I go about transcribing the language in the Latin alphabet given this variation? Finally, I have begun to try to create a computer font as suggested by a previous poster. Is there a recommended way of streamlining it, so that maybe I can scan my handwritten characters and then just beautify them? Or much I make each symbol by hand from scratch? P.S. I have subscribed to the topic. Thanks for the reminder, I feel dumb. I would say transliteration is probably the best course with this. I would love to see an image of this language. You mentioned earlier that you had some trouble sharing images on this website. To do that, you need to upload the image to a server, and then link the image in the [img] tags. Usually, we use imgur.com for this. On the question of scanning the characters, I don't think any method exists to streamline it, other than scanning the multiple images at one time. I imagine you could write multiple characters in one paper, and then scan that all together and then use a sprite clipping software to get 4 different images, but I'm not sure how well that would work. So, I have one question about transliteration: there are different pronunciations of different words. How do I work with this? I am trying to do a PinYin-style input panel, so should I just go with the closest English approximation of the most common pronunciation of a word? Should I pick one standard general set of phonemes and go with it? Is there a standard procedure for this. Now, for an image of the language. I shall post one test first just to see if this works. This is the first thing I found: a poem written to my mother by my (then) 10-year-old older sister in 1986. A few things to note: first, note that the date is written in English / Arabic numerals. There are numbers in Kidden, in base 10 (not base 60 like Babylonian numerals), but they were not used here. Next, the handwriting is bad -- mind you it was written by a 10 year old. Next, the grammar is also (somewhat) wrong, and I can point out the errors if you so wish. Finally, please ignore the coffee stain, wrinkling, and the, *ehem* embellishment by my baby self with the scribble in the corner. This is actually very intriguing. Some things might raise a few eyebrows, though. A language with very few (known) speakers, but a fully formed writing system which has been kept and transmitted through the family? Clicks used by only 2 speakers? It would be great if you could give us an example word-list, of say, numbers 1-10 and some other basic words (or the Swadesh list as mentioned). The best way to transcribe things is to use the IPA (international phonetic alphabet) if you are familiar with it. If not, learning the basics of it could help you transcribe the language accurately - Wikipedia has some helpful articles on it. In the meantime, it could be interesting if you gave us a few examples of the language (even if you don't use IPA)? The board's collective linguistic knowledge might be able to help identify it. Davush: Thank You for replying. I am also confused as to why I cannot find any other speakers of Kidden or who use this writing system. My best guess is that, wherever we came from, was probably rather poor, and that there might be other speakers from whatever "old" country who just haven't gone online yet to tell about it. The other conundrum is that we have lost much of our culture, which strips away clues to our origin. We all have American first names, our last names are all Arabic [note that my screen name is a completely made-up pseudonym], eat American food, and all of my grandparents are (sadly) no longer here to answer my many questions. As for the variety of our pronunciation, that I simply cannot explain that. I figured that the family would have come over here from a single area with one accent or vernacular, but maybe not. Either that, or maybe the language used to be more similar at one time shortly after they came, but after that different parts of the family started speaking differently. I have no idea why my cousins speak with clicks. My best guess, as I said before, is that they are mispronouncing it -- which would give credence to the idea that the language used to be more similar at one time. Here are the numbers 0-10, 100, 1000, and 10,000. The closest I could find was some Indian languages, but that is impossible given that we are from Syria or somewhere in Europe / Near East. Next is the Swadesh list. I took the shortened one listed on Wikipedia, and tried to transliterate as best as possible (note that my pronunciation of English is New-Jersey based). I tried to do the IPA thing, but there were too many symbols that I did not understand the intended sounds of, and also I tried to list where the most significant variations of pronunciation were. I also looked into "computational linguistics," again note that I am by no means a linguistic expert, to see if there were any patterns of letter change from another language. As I have no tools to do this, all I was able to find was that, some words looked vaguely Arabic. 47. dog	Kook (like what you call a crazy person) or sometimes like "cook"
1) The number 1000 is better transliterated as just "Oo," because the "H" sound is less common in Kidden. It happens, but I have an inkling that it was not the original pronunciation because "H" is such a rare sound. 2) New / "Siw" is pronounced like "to sue somebody for fraud." Could also be written as "Soo." 3) Numbers after 10,000 are measured usually in multiples of 10,000, so one hundred million is 10,000 10,000, or "Ti lak lak." Also note that "Ti" also behaves like the words "the" or "a" in English, I guess what you could call an "article." 4) For the word "dog" / "kook," we also sometimes say "gook" or "cook" (actually one of our dogs was named "Cookie" for this reason). Last edited by Shayquanne Taylor on 09 Jan 2017 22:12, edited 1 time in total. Shayquanne Taylor wrote: 1) The number 1000 is better transliterated as just "Oo," because the "H" sound is less common in Kidden. It happens, but I have an inkling that it was not the original pronunciation because "H" is such a rare sound. More likely, /h/ was the original sound but was deleted. /h/ rarely if ever just appears for no reason, but it is often deleted. GrandPiano: That is interesting. I did not know that, but I guess it makes sense. The question would then be how did the "h" sound get almost entirely wiped from the language but stick around in just a few words? Can you give us some example sentences? This is almost surely Indo-European. Looks similarly to some Indian words. Maybe it's Dom or a Kurdish language. Some of the letters remind me of the alphabet used for Berber languages, spoken in North Africa. This said, it is an alphabet and Berber languages don't commonly use monosyllabic words.